When it comes to combining sweet and salty, the Thai people are second to none. We’re just really good at it. Watermelon and dried fish? Check. Sweet custard with fried shallots? Check. Garlicky, shrimpy, spicy fruit salad? Yup. Mangoes — apples in this case — with a dipping sauce containing shrimp paste, fish sauce, and dried shrimp? A national favorite. This sticky fruit dip called nam-pla wan (น้ำปลาหวาน) is most often served with tart green mangoes (sliced lengthwise and thinly to make it easy for you to scoop up the chunky sauce with them). In fact, the name of this sauce is hardly ever invoked in isolation from the word mango, ma-muang (มะม่วง). However, I’ve found that this dipping sauce also goes very well with other fruits as long as they’re tart (and preferably firm in texture). This sweet and salty (and somewhat hot) dip begs for a companion that is sour. Together they form the famous sour-salty-sweet-hot flavor combination which you love so much about Thai cuisine. 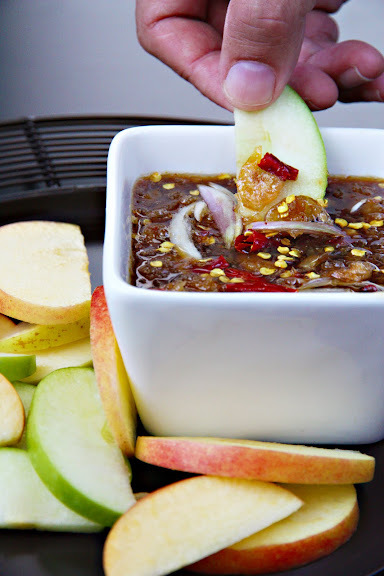 The slightly tart and tannic santol works very well with this dip. Under-ripe pineapple is also a good candidate. My favorite? Tart, crisp apples. Granny Smith is the best. It used to be that I regarded tart apples as a substitute for green mangoes which can be hard to find in my neck of the woods, but I have now considered tart apples as right up there with the more traditional green mangoes. In fact — and don’t tell the mangoes — I much prefer tart apples these days. 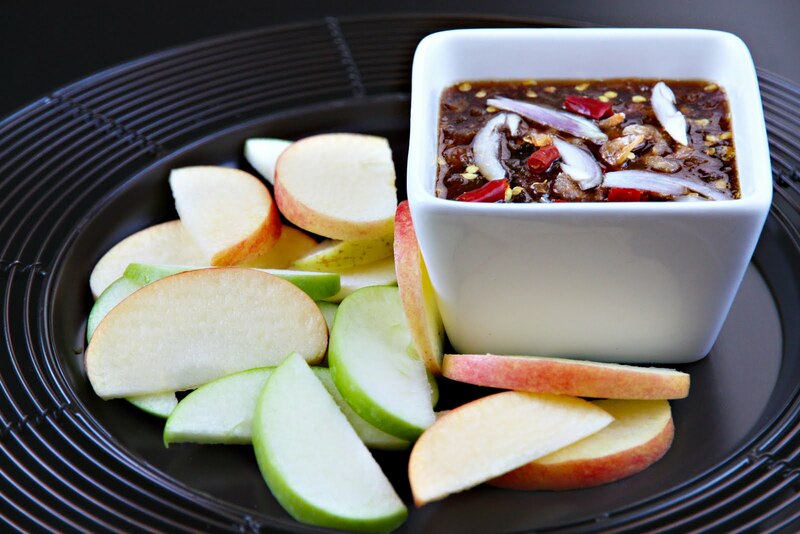 Apples, dried shrimp, shrimp paste, chilies, and fish sauce can co-exist harmoniously. Who knew? The best nam-pla wan I have ever had in my life is sold at Je Paeo (เจ๊แป๊ว), a fruit-dip stand in Chinatown, Bangkok. They set up their stand around 7:00 p.m. with a humongous glass jar of nam-pla wan. By 9:00 p.m., the glass jar is almost empty. But good nam-pla wan can be found anywhere in Bangkok. At Or Tor Kor Market, there’s a vendor that sets out a bowl of nam-pla wan and green mango slices for people to sample while telling them about all the celebrities who drive across town to the market just to buy her famous dipping sauce. In the fruit section of the freeloaders’ paradise, also known as the supermarket inside Siam Paragon, they also often set out a bowl of nam-pla wan and green mango slices for you, especially during the mango season. Though Nam-pla Wan and mangoes is such a common dish in Thailand, its popularity has not crossed over to North America or Europe. Most likely, it’s not on your favorite Thai restaurant’s menu. And the reasons are pretty obvious. So, if you’d like to find out what it tastes like, you’re going to have to make it yourself. Fortunately, it’s very easy to make. Oh, and please don’t be scared by the shrimpy and fishy elements; they become subtle and mellow. Crush the palm sugar (and cane sugar, if applicable) with a large cleaver or a granite pestle into small chunks. This allows it to melt more quickly and easily. Place the sugar(s) in a medium pot along with the shrimp paste and fish sauce; set the pot over low heat. Keep stirring until everything has melted and come to a gentle boil. Remove the pot from heat and let the syrup cool to about 100°-115°F (43°-47°C); it will also thicken up slightly upon cooling. You should end up with about 1 1/2 cups (360 mL) of sticky sauce that has the consistency of maple syrup. While waiting for the syrup to cool, divide the dried shrimp into two equal portions. Pulverize one portion in a food processor or coffee grinder until you get fluffy, tiny flakes; keep the other portion whole. Stir the dried shrimp and the shallots into the syrup. The residual heat of the syrup will wilt the shallots slightly. And while the moisture from the shallots will thin out the sauce somewhat, the dried shrimp flakes give it body. Crush up with your fingers the amount of dried chilies commensurate with your heat tolerance and stir that in. The sauce is ready to be served with your favorite tart fruits. Provided that you keep the sauce in an air-tight container and don’t dip (or, worse, double-dip) the fruit right into the container, the sauce should keep, refrigerated, for a month. I go crazy for sweet and salty hence the reason why I love Thai food! 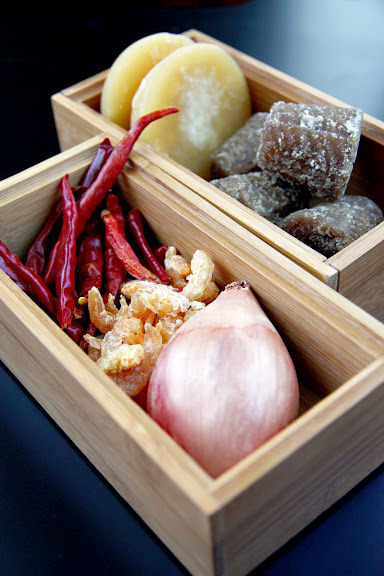 I like the way you describe thai gastronomy and give people and insight of authentic thai dishes and treats which “haven’t even crossed over” like you said =) Great blog!! We Filipinos dip their mangoes in bagoong (shrimp paste), too. And those of us who are Americanized will also dip our fruits into just plain vinegar. Apples and plain vinegar are divine. Omg i love your blog so much. I am an international student living in Australia. Every single thing I cook from your blog taste just like what I can get in Thailand. I am soooo making this !!!! A friend introduced me to ma muang nam plaa wan earlier this week, at that same shop you talk about in Yaowarat and I simply fell in love with it.. The day after I bought some at BigC.. but it was a totally different quality/taste.. This looks fabulous. Yet another thing I wish I had tried in Thailand. Thank you do much for this blog! I’m a native of the deep south US, and good Thai food can be hard to come by. My best friend growing up was Thai, and her mom was and is a great cook, so I spent my formative years eating her home cooking. I have the same sort of nostalgia for Thai food that most Southerners have for, say, chicken and dumplings. So after YEARS of disappointing experiences at Americanized Thai restaurants I’m finally going to venture making some of these dishes I remember so well from childhood. I remember eating this dipping sauce with crabapples at a picnic with my Thai and Cambodian friends. I’ve described it to other people and they think I’m nuts! I can’t wait to try this and the stuffed bitter melon soup, another old favorite of mine. So excited!!! I am now addicted to this dip.